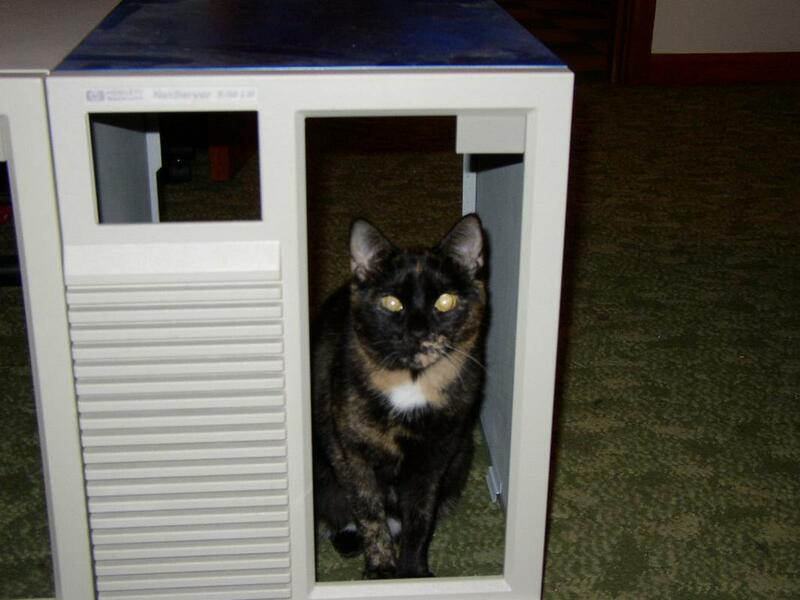 Both NetServers (4d/66 on top), two different types of SCSI disk tray and two pictures of my cats in the HP cases. 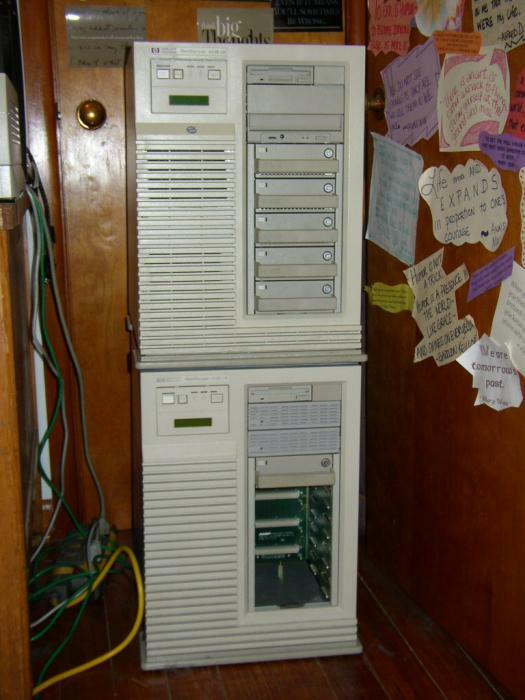 The HP NetServer is a reasonably high-class PC server, and the series has been around since the mid-to-late 90's. I'm not terribly famaliar with the history of the line, but I know about my two machines. Both HPs are LM series, comprising of a two-part chassis for the cardcage and the drive cage. The mainboard has onboard FDD, single IDE channel, twin Fast-Wide SCSI channels and 8 EISA slots. The system uses 72p SIMMs, 4M - 32M, not only has it four slots on the mainboard but also a slot for an expansion board which, I believe, has eight more slots. The processor is also on a removable module. 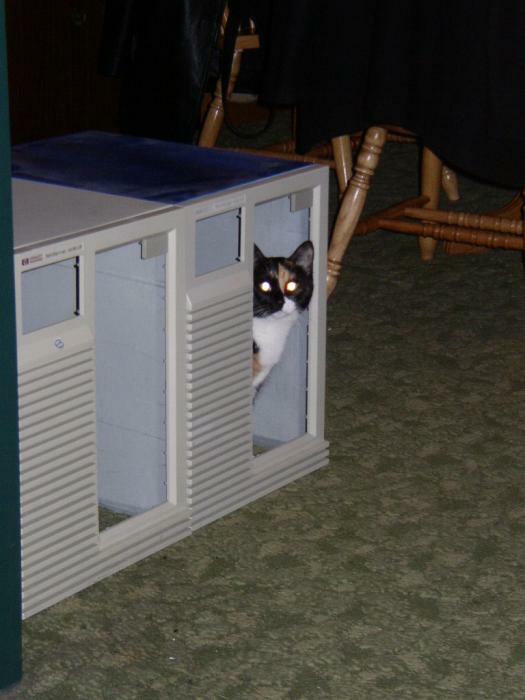 The 4d/66 has an intel 486 66mHz processor, and the 5/60 a Pentium 60mHz. Asides from this processor difference, and a different sticky label on the front, the units are identical. 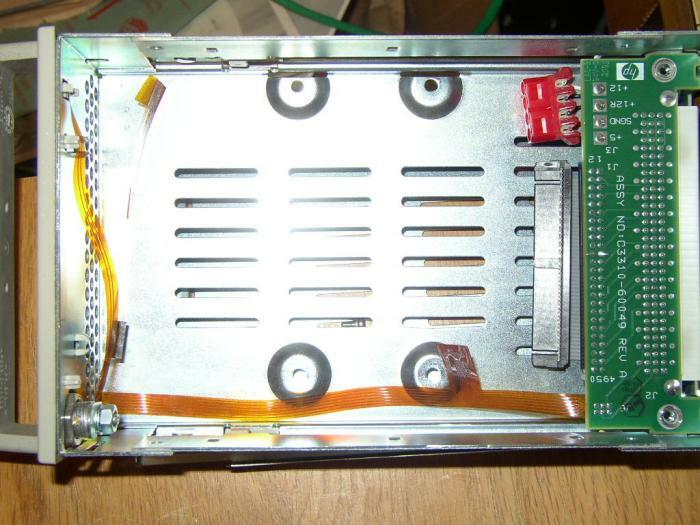 The drive cage has 8 horizontal slots, the upper is fixed for a 3.5" FDD, two below are open for any type of tray, and then below this is an enclosed SCSI disk array with five sleds. 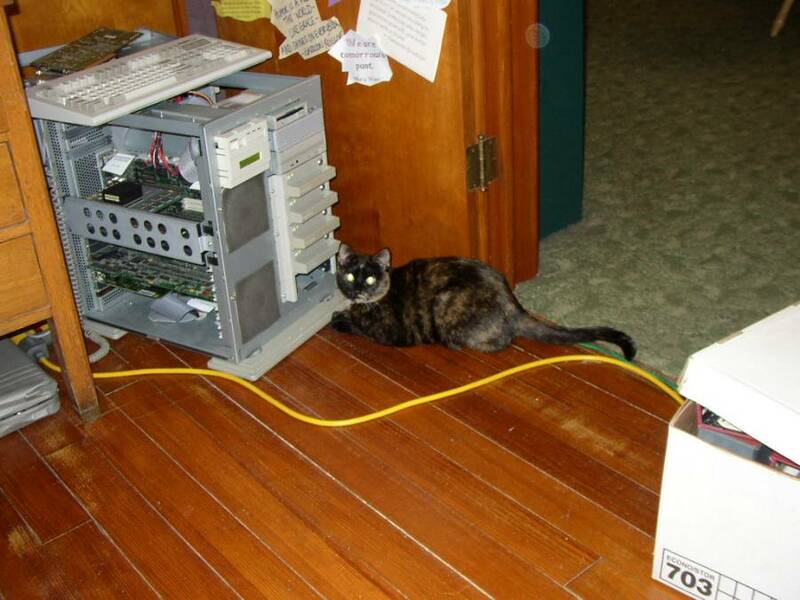 Not only does the unit have the SCSI array but also a 3' long SCSI cable with seven connectors on it presumably if you wanted to pull out the SCSI backplane and put in standard disk trays. Both units came with a Mylex DAC960 RAID card, with a full complement of memory, which I'm assuming is standard for the unit - this RAID card is what is attached to the SCSI array. Unfortunately Linux only supports the ISA and PCI DAC960 cards, so its quite useless for me. Unfortunately my first unit gives me memory errors on startup (It has quite a fancy beep code to say "First 64k RAM bad"), even when there is no memory installed I get the same error, so I'm assuming something on the mainboard is unhealthy. The second HP I intend to throw the Pentium into (Slower in the mHz but with better cache and branching logic == faster) and run Linux on. I'm kind of doing this a little backwards to get around the BIOS restrictions and the like, but I have Linux installed on a 2.1G IDE disk, which the BIOS can't boot off, so I'll use a permanently inserted FDD to boot into Linux. 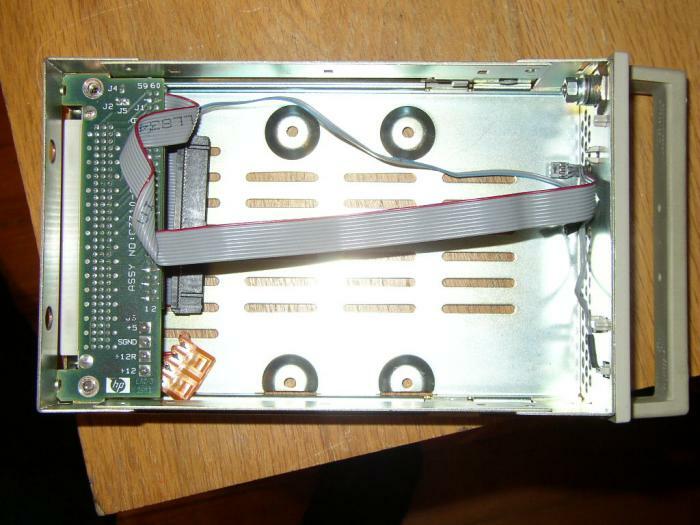 The disk array, which I'll move the connect from the Mylex RAID card to the onboard SCSI, I'll set up using Logical Volume Management and hook together as one big disk... I might also attempt a RAID5 software RAID, but I'm unsure how slow this will be - although by all accounts Linux's software RAID is pretty quick. I have a collection of docs for this (Manuals, Beep Code descriptions, Boot Code errors) so if anyone wants it and can't find it on the HP site anymore, drop me an eMail.